Highlights of Italian Week http://www.italianweek.com.au/ produced by Alessandro Sorbello http://www.alessandrosorbello.com/ for the Italian Government as shown on RAI International. The segment aired internationally and showcased the events of the Friday night and Sunday concert. Raitalia is the international television service of RAI, Italy's public national broadcaster. Italian Fashion Week is an event organized to promote Italian design and Made In Italy. Appreciated and valued the world over, Italian fashion and Style is has inspired countless designers and stylists. During Italian Week, Italian born designer Elio Marzullo owner and creative director of the label Elio Moda showcases Italian designs and Italian Inspired works from designers such as Subfusco and emerging stylists from Metropolitan South Institute of TAFE, fashion who have created a range of Italian Inspired designs. Direct from Italy and supported by the Italian Embassy in Canberra, Italian Week is proud to present Fatima Scialdone, Roberto Nobilia performing at the Opening of Italian Fashion WeekAustralian born Roberto Nobilia Robert has written and recorded many albums, including the work of Stark which is the collaboration between himself and musician/producer Lindsay Askew who plays guitar Italian Motor Expo 2009 Queen Street Mall and Reddacliff Place For lovers of the sleek lines and high performance of Italian Motor vehicles, the Italian Motor Expo is not to be missed. 18 year old rising star, Zosia Kilmartin, is a classically trained singer. One of the highlights of Zosias career, to date, is her recent appearance at the annual Opera on the Mountain open air concert in May. 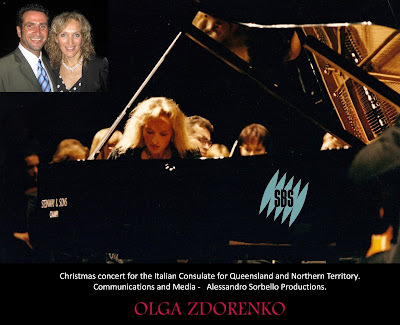 This event featured Zosia along with 10 of Australias top opera singers Alex Ranieri 16 year old Alex Raineri currently studies piano performance with Leah Horwitz, OAM at the Queensland Conservatorium of Music and also studies composition with Gerard Brophy. In November 2008, Alex was awarded a distinction in his Trinity College of London' LTCL exam and the Top of the State award. Also in 2008, Alex performed Gershwin's 'Rhapsody in Blue' with the Queensland Orchestra in the keyboard finals of the 'ABC Symphony Australia Young Performers Awards'. Raffaele Pierno is a graduate of the Conservatorium Domenico Cimarosa in Avellino, Southern Italy. Graduated with a Diploma di Canto in 1998. He performed extensively across Italy including Concerts of traditional Neopolitan songs for the Mayor and the Cardinal of Naples in il Duomo di Napoli; tribute to Enrico Caruso 1995; Messa di Gloria of Mascagni with Lucia Tramontano (official accompanist at Teatro San Carlo). Dominique Fegan Dominique has performed with numerous operatic societies in south east Queensland and in the UK. Principal roles include Casilda in The Gondoliers, Angela in Patience, Anna in The Merry Widow, Josephine in HMS Pinafore, The Plaintiff in Trial by Jury, Phyllis in Iolanthe, Guenevere in Camelot, Maisie in The Boyfriend, and Hugette in The Vagabond King. Dominique joined Opera Queensland as a chorus soprano in 1995 and has appeared in numerous concerts and productions. Italian Waiters Race Waiters and waitresses representing Italian restaurants in Queensland will gather in The Queen Street Mall to compete in a relay race with a difference—the runners have to carry glasses of wine on a tray without spilling a drop.The waiters race, or Corsa dei Camerieri in Italian, is one event of the Tastes of Italy to be held over the weekend. Marco Evans in concert Marco Evans grew up in a very musical household. His grandmother, father and his aunt are all singers, musicians and performers. Lisa Hunt in concert - Lisa Hunt began singing in that great African American tradition, the gospel church, there was laid the foundation of her soulful singing style. In Italy she has been the featured vocalist on tour and recordings of ZUCCHERO Sugar Fornaciari for over 15 years and has worked with a range of artist from Andrea Bocelli, and Luciano Pavarotti. You can check out her on Pavarotti and friends. Filmed at the Westpac bank, an Italian Week sponsor, Phil Di Bella, Francesco Capecchi, Fatima Scialdone, Alessandro Sorbello http://www.alessandrosorbello.com , Donagh Worner discussed the upcoming Italian Week 2009 http://www.italianweek.com.au with QCTV. Dear Mr. SorbelloI wish to congratulate you for your great contribution to the success of the Official Italian Week 2008. 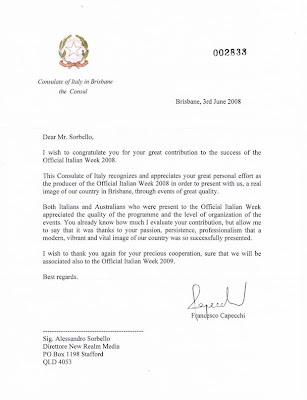 This Consulate of Italy recognizes and appreciates your great personal effort as the producer of the Official Italian Week 2008 in order to present with us, a real image of our country in Brisbane, through events of great quality. Both Italians and Australians who were present to the Official Italian Week appreciated the quality of the programme and the level of organization of the events. You already know how much I evaluate your contribution, but allow me to say that it was thanks to your passion, persistence, professionalism that a modern, vibrant and vital image of our country was so successfully presented. 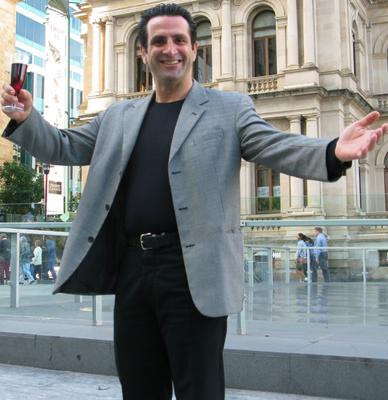 In 2007, producer, Alessandro Sorbello http://www.alessandrosorbello.com/ interviewed Louie Shelton on Australians Gold Coast for New Realm Media http://ww.newrealm.com.au/ . Louie Shelton http://www.louieshelton.com/ discussed his career and the his experiences playing with such artists as Boz Scaggs' "Low Down", Lionel Richie's "Hello", Neil Diamond's "Play Me", The Jackson Five's "I Want You Back", "ABC" and "I'll Be There, The Monkees' "Last Train To Clarksville" and "Valerie". Some of the other artists Louie recorded with include John Lennon, Whitney Houston, Barbra Streisand, Marvin Gaye, Diana Ross, The Carpenters, Joe Cocker, Kenny Rodgers, The Mamas & Papas, James Brown, Ella Fitzgerald and many others. 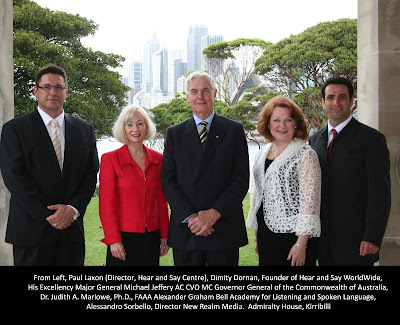 On the 24th of October 2007, His Excellency Major General Michael Jeffery AC CVO MC Governor-General of the Commonwealth of Australia, launched Hear and Say WorldWide at Admiralty House at Kirribilli in Sydney. Honoured to be a guest of the Governor-General, It was my pleasure to film and produce the footage of the launch. The Governor-General is the patron for The Hear and Say Centre . You may wish to see some photo's of the launch and you can read the Governor-Generals speech. The launch of Hear and Say WorldWide coincided with the release of Peter Cupples new Album ‘about time’, Peter graciously allowed me to use some of his music on the production of the films. 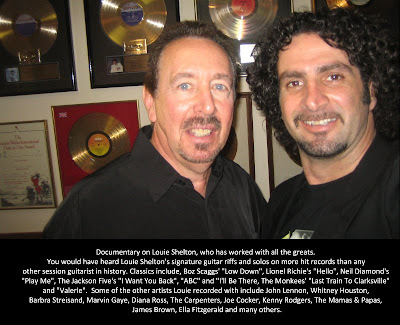 Louie Shelton An abbreviated mini documentary on Guitar legend and producer Louie Shelton, who has worked with all the greats. Have a look at the albums he worked on or produced.. You would have heard Louie Shelton's signature guitar riffs and solos on more hit records than any other session guitarist in history. While there are too many to mention, some of his classics include, Boz Scaggs' "Low Down", Lionel Richie's "Hello", Neil Diamond's "Play Me", The Jackson Five's "I Want You Back", "ABC" and "I'll Be There, The Monkees' "Last Train To Clarksville" and "Valerie". Some of the other artists Louie recorded with include John Lennon, Whitney Houston, Barbra Streisand, Marvin Gaye, Diana Ross, The Carpenters, Joe Cocker, Kenny Rodgers, The Mamas & Papas, James Brown, Ella Fitzgerald and many others. At the official Launch of Italian Fashion Week in Australia, Elio Marzullo creative director of the label Elio Moda, the Italian Consul, The Ambassador of Italy, Gian Ludovico de Martino di Montegiordano and Italian Week Executive Producer Alessandro Sorbello celebrate a successful international collaboration between the Queensland and Australian Government after the Italian Fashion on Show in the Queen Street Mall. Sink your teeth into Brisbane's Italian Week. Ask the boss of Italian Week where to get a slice of authentic pizza in Brisbane, and he doesn't want to talk about it. Rather than focus on age-old images of red-and-white check tablecloths and steaming bowls of bolognese, Alessandro Sorbello would rather talk about the modern Italy. 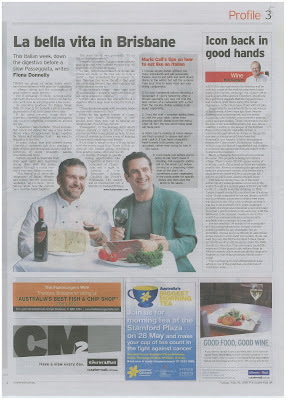 The producer of Italian Week 2009 said it was time Brisbane embraced the complexity and depth of modern Italian culture, rather than just focus on the past. "It's important that we do not ignore our heritage," Mr Sorbello said. "Neither should we let the past hold us back." The recent closure of Newmarket's long-standing Italo-Australian Centre was a sign Italian culture in Brisbane needed to move with the times, he said. "After several decades of offering a place for Italians and people passionate about Italy to unite, this Brisbane icon leaves a large gap within the Italian community," he said. "(This) highlights the need to evolve and celebrate Italy as the modern, fascinating and alluring country that it is today." Hence the program for this year's Italian Week, which runs for a week from today, is designed to cross generations and celebrate the integration and differences between the cultures of Australia and Italy. "Whether you're a connoisseur looking for a taste of the world's finest wine or homemade pasta, or a fashionista looking to the catwalks of Milan for inspiration, Italian Week is a chance for locals to experience the culture and delights of this beautiful country," said Mr Sorbello. Now in its third year, Italian Week will this year be housed predominantly in Queen Street Mall for the first time. The program comprises a host of film, opera, music, fashion and food events, culminating in Festa della Repubblica (Italian National Day). 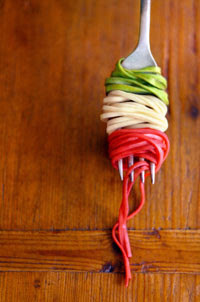 "We were really trying to express the full gamut of Italian ingenuity and attitude to life this year," Mr Sorbello says. "From astronomy to gastronomy, technology and textiles, this year is about the good life, the old life and the new life." Workers strolling through Reddacliff Place in Brisbane's CBD today got a colourful taste of what to expect from the second half of Italian Week. Models draped themselves over a Vespa scooter and red Fiat convertible, three tenors paid tribute to operatic icon Luciano Pavarotti and waiters from the old country practised running with trays of wine-filled glasses. Festival producer Alessandro Sorbello said the week-long celebration had already been a hit with the city's residents, but the best was yet to come, including Italian Fashion Week parades, numerous musical performances from internationally renowned artists, a motor show and more food events. At the end of the day, however, he said he hoped the festival left Brisbane residents with a deeper understanding and affinity for the Italian way of life. "Italy has such a rich culture that we want to start to really now tap the broader, the deeper dimensions of it,'' he said. "We want to say it is about food, it is about fun and wine, but there's much, much more to it as well there's also a way of life. They (Italians) are very much orientated around now, about being spontaneous. "You don't know which day is your last day so why not have a great day every day?'' Mr Sorbello said there was no reason why the sunshine state's celebration of all things Italian could not become bigger than its southern rivals. "We're going to keep building,'' he said. Major events over the coming days include fashion parades showcasing Italian and local designers' creations in the Queen Street Mall on Friday and the weekend; the Italian Motorshow in Reddacliff Place on May 31; the Italian Waiters Race held as part of Tastes of Italy on May 31 which re-enacts the 1950s race in Rome's Colosseum and a host of free concerts from star performers on the Queen Street Mall stage and in Reddacliff place.